With its name taken from a GK Chesterton poem and the line itself actually meant to be referring to the nearby cemetery, you will find yourself pleasantly surprised by this beautiful pub. The décor is flawless and everything seems to glitter and shine from the chandeliers to the polished red chesterfield sofas, its definitely not a back street boozer and oozes vintage charm and glamour. The clientele pulls itself from the well-groomed fashionable West Londoners and is usually a crowd of 20-30-something professionals. 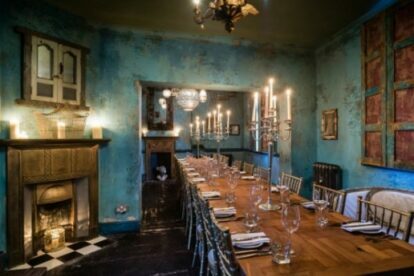 I haven’t had the pleasure of exploring all of the function rooms but have had a peek in a couple and all have the same shabby chic theme carried on from downstairs. The garden isn’t huge but has a couple of tables that get snapped up quickly if the weather is good. The food is delicious, there is a good selection of cocktails and I can definitely vouch for the espresso martinis!